Had two cavities filled and the ENTIRE experience was pain free and relaxing. Couldn't be happier with my experience, Dr. Mody and staff are GREAT!!! Good experience. Kay is always wonderful and Rachel was excellent. Dr. Mody was very nice and took the time to explain everything. Fill out our appointment request form and we will call you to confirm the appointment Date and Time you have chosen. 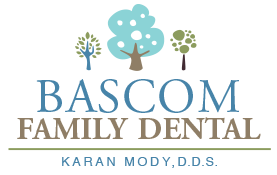 Here at Bascom Family Dental, you can get the best dental care for the whole family. Our San Jose dental practice involves the latest technologies in dental care and a wide variety of services for your family. Prevention is the best way to protect your dental health. At Bascom Family Dental, we want to help every member of your family avoid future dental work by ensuring we catch problems early, before they do harm to enamel and gum tissue. General dentistry is the care you need to keep your teeth and gums clean, healthy, and strong. Cosmetic Dentistry refers to a variety of dental treatments and procedures that are customized to improve the appearance of teeth and gums.